Red Bramman is a unique legendary Scout creature card. It is part of the Core Set. "Drown in the river of battle!" "They call me the Bandit King!" This card's summon ability applies the A Pirate's Life card effect. For unknown reasons, this effect is applied three times upon the enemy creatures. 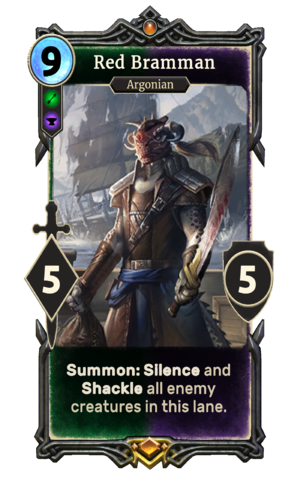 Red Bramman is mentioned in the Pocket Guide to the Empire and the Improved Emperor's Guide to Tamriel, although these books state that he is human.